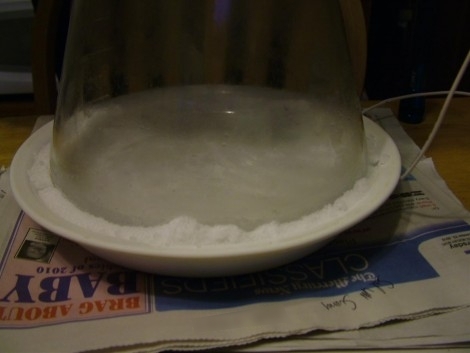 [Pabr] is trying to make dry ice the hard way by building a thermoelectric dry ice generator. The project is a well planned round trip through thermodynamics and cryogenics with a hard landing on the icy grounds of trial and error. 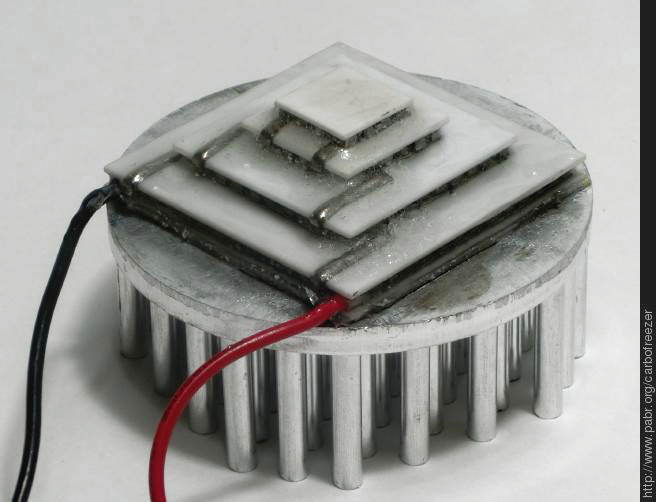 [Pabr’s] four stage Peltier element on a heatsink. While dry ice can be obtained with simpler methods, for example by venting gaseous CO2 from fire extinguishers and collecting the forming CO2 flakes, [pabr’s] method is indeed attractive as a more compact solid-state solution. The setup employs a four stage Peltier element, which uses four Peltier stages to achieve a high temperature differential. With sufficient cooling on the high-temperature side of the element, it should be well capable of achieving temperatures below -78.5 °C, the sublimation temperature of CO2. So far, [pabr] has built three different setups to expose small amounts of CO2 to the cold of the Peltier element, hoping to observe the formation of little dry ice flakes. If you’re going to send some hardware up to 100,000 feet, where atmospheric pressure is 1% of what we enjoy on the surface and temperatures swing down to where Fahrenheit and Celsius don’t matter anymore, you might want to do a bit of testing to make sure everything works before launch. With a few bits of PVC, though, that’s a piece of cake. There were several environmental conditions to take into consideration; the near vacuum experienced by high altitude balloons would be replicated by a refrigerator compressor, the increased solar flux is simulated by a light bulb, and the cold temperatures provided by a chunk of dry ice. For a proper high altitude, low temperature environmental chamber the test payload should be cooled down via radiation with tubes filled with liquid nitrogen embedded in the walls. This is the NASA way of doing things, but for the budget of $200, [arko]’s chamber simulates a high altitude environment just fine. Not to be outdone with hair spray powered PVC cannons, [William] created an even cooler device: a cannon powered by dry ice. Once dry ice is loaded into the pressure vessel, a burst disk is placed in the breech and the barrel is screwed on. The trigger isn’t very precise – the entire gun is powered by dry ice turning from a solid into a gas – but the resulting cloudy booms more than make up for any imperfections. Despite building a cannon and using PVC as a pressure vessel, [Bill]’s project is actually quite safe. The ‘trigger’ is a burst valve made out of a disc of aluminum foil held between two sections of PVC. When the pressure rises, the aluminum foil inevitably tears, shooting whatever is in the barrel out and hopefully not into an eye. The ‘safety’ on the gun is a ball valve connected directly to the pressure vessel, and with a pressure gauge and a release valve. We’re more than confident in saying this is pretty darn safe as far as PVC cannons are concerned. [Paul] is sick and tired of his homemade root beer being flat. 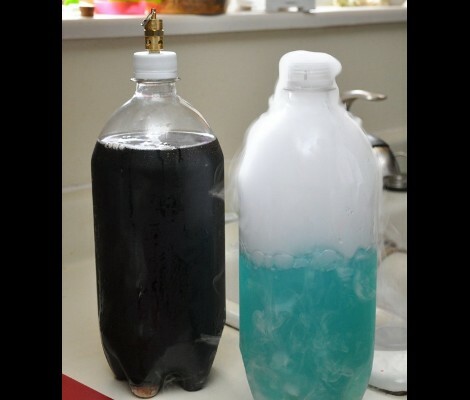 He analyzed the problem with his carbonation techniques and ended up with a method of force carbonating beverages using dry ice. He starts of by discussing the various methods that are used to carbonate beverages. There’s the old yeast and sugar trick that takes place inside of a sealed bottle. But this takes time, and if you don’t calculate the mixture correctly you could have over or under carbonated bottles (or exploding bottles in the case of glass beer bottling). [Paul] himself has tried the dry ice in a cooler full of root beer method. The problem is that the cooler isn’t pressurized so the carbonation level is very low. You need to have cold temperatures, high pressure, and the presence of carbon dioxide all at the same time in order to achieve high levels of carbonation. His solution is to use a 60 PSI safety valve. He drilled a hole in a plastic bottle cap to receive the valve. He then drops a few chunks of dry ice in and seals it up. The valve will automatically release the gas as the pressure builds past the 60 PSI mark. What he ends up with is a highly carbonated beverage in a matter of minutes. If you don’t mind spending some cash you can use an adjustable pressure regulator. This way you can carbonate just about anything. 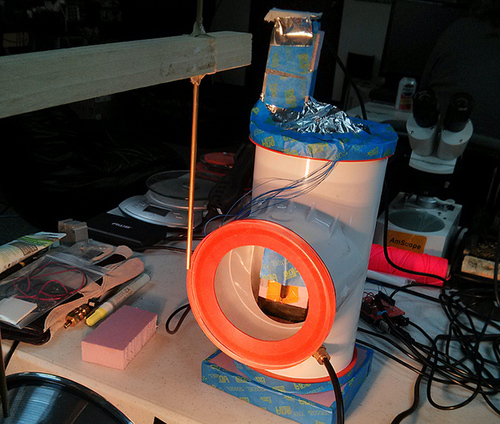 [Kenneth] and [Jeff] spent a weekend building a cloud chamber. This is a detection device for radiation particles that are constantly bombarding the earth. It works by creating an environment of supersaturated alcohol vapor which condenses when struck by a particle travelling through the container, leaving a wispy trail behind. This was done on the cheap, using isopropyl alcohol and dry ice. They already had a beaker, and after a few tries figured out that the dry ice worked best when serving as a bed for the flask. A black piece of paper was added inside the base of the container to help raise the contrast when looking for condensate. They experimented with a couple of different methods for warming the alcohol, including an immersion heater built from power resistors. There’s a video explaining the apparatus which we’ve embedded after the break. It’s a bit hard to see evidence of particle travel in the video but that’s all the more reason you should give this a try yourself.